As the world turned this week@work, journalists continued to highlight the lack of diversity in the workplace: in the writers rooms of TV, the publishing industry and tech. The National Endowment for the Humanities announced a grant initiative to align graduate education with employment prospects. A survey from Chapman University identified our top fear as corruption of government officials (unemployment and public speaking being way down on the list). And a CEO offered advice on the one mistake job seekers make. Things are not looking good on the diversity front. Aisha Harris reporting on Slate.com, investigated the lack of progress on diversity behind the camera, in the rooms where plot and dialogue are created for your favorite TV shows. “A Writers’ Guild of America report released earlier this year noted that staff employment for people of color actually decreased between the 2011–12 season and 2013–14 season, from a peak of 15.6 percent to 13.7 percent. The number of executive producers of color also decreased in those seasons, from 7.8 percent to 5.5 percent. While the 2014–15 season may have seen those numbers increase thanks to the addition of a few shows with diverse casts, such sharp declines demonstrate how tenuous progress in Hollywood can be. Jim Milliot, the editorial director for Publishers Weekly, reported on their annual publishing industry salary survey. While the results indicated younger employees may be replacing the old guard, the workforce is still predominantly white. The common thread in all of these ‘lack of diversity’ conversations is the ‘wishful thinking’ for a quick fix. The majority of the careers covered in these articles are filled by ‘contract’ employees. The hiring is tied to a project. When the next project begins, folks hire their trusted colleagues from previous gigs and there are few openings for a newbie. Diversity requires a long term investment in education, internships and mentoring – creating a new career pipeline. One solution I personally observed in my corporate life was when a senior exec tied business unit management compensation to diversity targets. If you are rewarded for diversity – hiring and retention – there is a better chance for success. It’s not brain surgery; it’s a matter of priorities. Academia is another workplace that has continued to struggle with diversity issues, driven in part by an outdated tenure process and lack of career transition in senior faculty ranks. As students continue to enroll in PhD programs, their predecessors compete for the few faculty openings and get by cobbling together a mosaic of ‘contract’ adjunct positions. Until now, it was taboo for a grad student to speak out loud about pursuing a career outside the ivory tower. Colleen Flaherty reports for Inside Higher Education on the National Endowment for the Humanities recognition of diminishing tenure-track options and a proposal to explore alternatives. “Critics have long complained about doctoral education in the humanities, saying that it takes too long and no longer reflects the realities of graduates’ employment prospects. In other words, graduate humanities programs are still largely training students to become professors at major research universities, when the vast majority won’t, given the weak tenure-track job market. 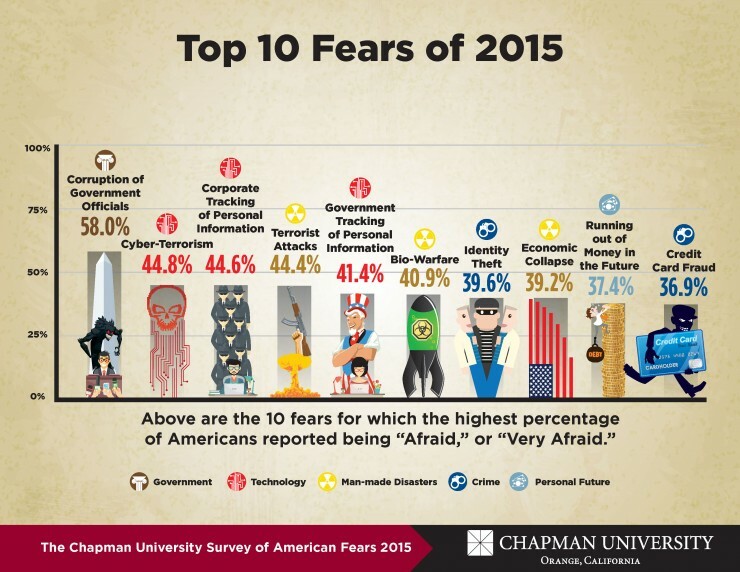 Based on the workplace issues we experience and read about, it may come as a surprise that workplace concerns are not at the top of this year’s Chapman University survey ‘America’s Top Fears 2015’. Cari Romm summarized the survey methodology and results in an article for The Atlantic. “For the survey, a random sample of around 1,500 adults ranked their fears of 88 different items on a scale of one (not afraid) to four (very afraid). The fears were divided into 10 different categories: crime, personal anxieties (like clowns or public speaking), judgment of others, environment, daily life (like romantic rejection or talking to strangers), technology, natural disasters, personal future, man-made disasters, and government—and when the study authors averaged out the fear scores across all the different categories, technology came in second place, right behind natural disasters. In the last article of the week, Business Insider writer Jacquelyn Smith, interviewed Liz Wessel, CEO and Co-founder of WayUp and discovered the biggest mistake job seekers make. The reason this “mistake” is so common, she says, is that a lot of people are good at being “team players,” and therefore try to share the credit. “In a lot of cases, this is a great instinct, and while it’s obviously important to work well in a team setting, it’s also important to convince an employer to hire you, not your entire team. The message in the week@work themes: those who are confident in their talent and able to articulate their value to an organization have the potential to contend for work in writing, publishing, tech and academia. But the playing field is not level and winning the coveted spots will ‘take a village’: committed employers, dedicated mentors, paid internships, educational outreach and community visibility.